Thanks to all the people who came on the Blackwater Valley Countryside Trust Bat Walk from Shepherd Meadows car park on 9th September. About 20 enthusiastic people came including several groups with pushchairs. Steve Bailey gave an introductory talk including demonstrations with a bat puppet! Most people can’t hear bats calling, so each group was given a bat detector to tune into various bat frequencies. Initially, the bats were reluctant to appear as the wind was blowing from the river making the hedge margins a bit chilly. We did hear one or two en-route to the Balancing pond. And then we found the bats. They were at the pond sheltering from the winds. We usually see Water bats (Daubenton’s bats) skimming across the water catching insects and we were lucky to some thatevening. They can be seen taking insects from the water’s surface with their feet! There were also lots of Pipistrelles flying about us and over the pond. What do bats really look like? It is hard to see at night, so we thought you’d like to see this photo of Pipistrelles roosting in a bat box. How many can you count? Some bat stats for you. 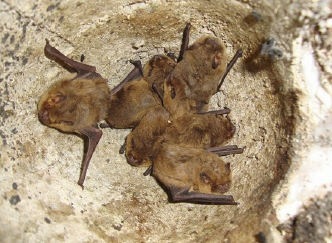 At this time of year the Blackwater Valley Countryside Trust visit bat boxes, throughout the valley, to count the bats in the boxes and look for signs of roosting in empty ones. We also take the opportunity to repair and replace old boxes.